Brian Cormack contacted me last week about heading to a little known place near Brinkley, Arkansas: Apple Lake. Apple Lake is located within the boundaries of the Dagmar Wildlife Management Area and is known for a sighting of the elusive Ivory-Billed Woodpecker. There are signs at the trailhead to the area that detail the differences between the all too common Pileated Woodpecker and the Ivory-Billed. It is a great spot to tromp around in a swampy area and get some cool shots of Cypress trees; especially the evening we were there. The color on the trees was perfect, but the light was somewhat lackluster. So, we stuck around for sunset. As the evening progressed, it got better and better. I finally found this composition and set up for about a 10 minute wait for the perfect light. Finally, the sun went behind a cloud and I was able to capture this scene in beautiful subdued light. 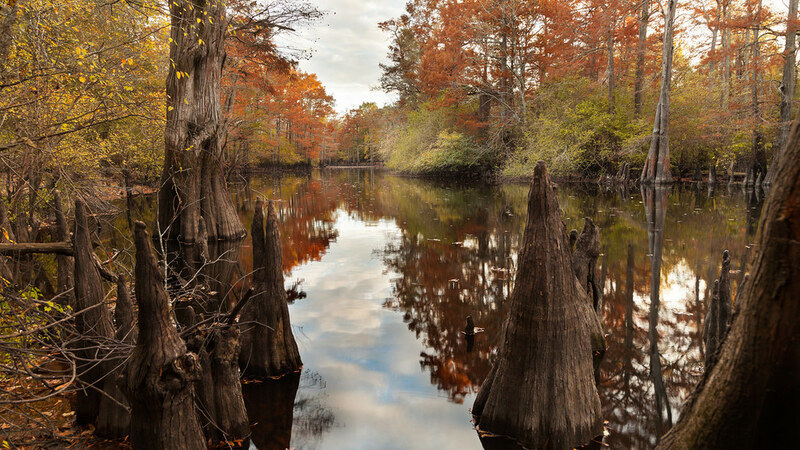 Fall is a great time to visit the swamps, not only are they beautiful, but there are no bugs! I suggest checking them out when the deer hunters have had their fun and it’s a bit quieter. Although, it was starting weekend of deer season, Brian and I lucked out and didn’t get shot. We’ll live on to photograph another day and maybe next time, we’ll spot an Ivory-Billed Woodpecker.